Our gorgeous White Lily Couture bride Sinead and Louis were married at the picturesque Kangaroo Point riverside on a warm February day. Sinead had a little 11-week-old secret to share with her new hubby, friends and family at their ceremony! 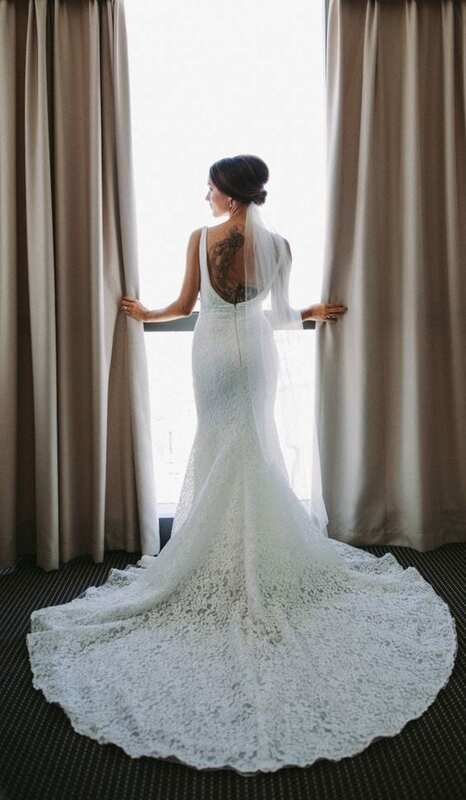 The glowing bride wore the MARICEL gown by Pronovias – a tailored lace ensemble with stunning full train. Paired with minimal accessories, makeup by Kate Johnson Artistry and gorgeous flowers by Frankie and Haley to really complete the bohemian look. Friends and family (with the exception of Sinead) celebrated with a traditional shot of Galliano at the ceremony. Sinead announced her little surprise to everyone that they’re expecting their first baby before moving onto their reception at The Mill on Constance where they all danced the night away. Photos of their magical day can be found below courtesy of Twig and Fawn Photography.